Last night was a bit odd as our hiking family had finally dwindled down to just three who stayed in the albergue. In place of known pilgrims were a cyclist group and several new faces who had just started yesterday in Zamora. We were quite impressed by the view of the Hermitage of the Virgin of Castile. While pilgrims can at times hike to it, the reservoir was full and we had to first locate a bridge. After a while, we left the open country and began walking on the side of a highway. According to our guidebook, this option (while a bit harsh on the feet) was a smart idea and shaves off a day of the Camino. As we stayed an extra unscheduled day in Salamanca and had planned several 40km+ days just before Santiago, a chance to get ahead would allow us to break up longer hikes in the future. At least that was the idea. By the 20th kilometer (and with five more to go), Mikey was really rethinking the plan. At this point, it was more of a wish that God would go with our aching feet. You see, dear reader, not only does asphalt have a much harsher impact than dirt, it heats up in the sun and that heat transfers to one’s shoes. 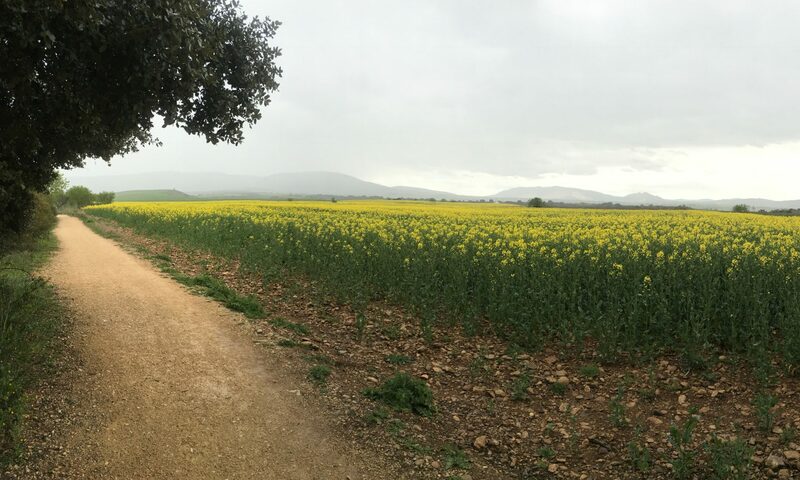 While we were more careful today, past Camino experiences have caused our feet to sweat and blisters to rapidly form. No bueno. After a long day of walking, we hobbled into the town of Tábara. It’s basically a small town with a few cafés around the Plaza Mayor, but not much else. We did, however, find a wonderful tapa that Mikey calls the Shakshuka pastry. It consists of a puff pastry filled with a tomato, bell pepper, and onion stew and topped with a fried quail egg. Pretty darn tasty. Afterward, we showered and rested before enjoying a communal dinner at our albergue. Since we had jumped ahead a day, we met up with another American pilgrim who had not stopped in Salamanca but our group of three was otherwise surrounded by all new faces. Today was definitely hard, but tomorrow seems equally daunting as news of a closed albergue will cause bottlenecking amongst the group and we may have to either fight for a bed or walk extra miles tomorrow. As such, we’re planning an early night tonight. Hasta entonces, que dios te acompañe.